Classic easel for working at the table. The height of the canvas holder can be adjusted individually up to 23" with the upper adjusting screw. 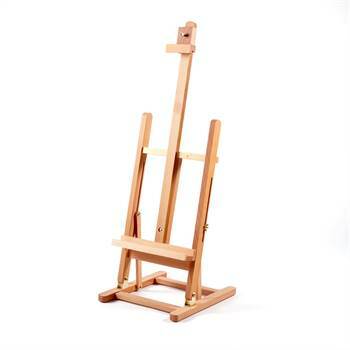 Because of its reasonable price this easel is also ideal for school classes and painting workshops. It is assembled quickly and can be transported easily. Practical tabletop easel, easy assembly and transport. Good value for reasonable price. Find more easels in our shop.